Okay, let's face it. Many companies still behave like fish tanks. Closed environment controlled by management... and "let's just not ask the fishes if...". As long as fish tanks can keep their fishes alive, feed them, let them breathe... the microcosm works fine. 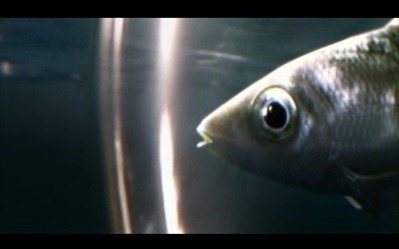 Nevertheless, some fishes jump out of the tank, into another tank. And sometimes new fishes even fall into the tank. Then, other "creative fishes", grow wings to fly out and discover the sky. The paradox of 2.0 is that (meanwhile) it grows outside the fish tanks, in the wild ocean. The consumers are aware and want to give their opinions. They want to be considered by brands. 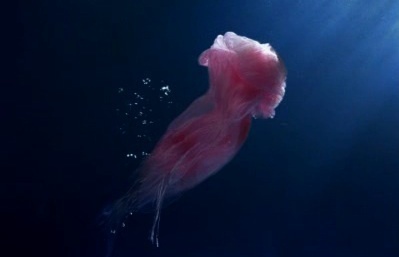 They communicate and spread the word over the net, like an enormous wave growing on the ocean. Nothing can stop the move... it is like a natural pressure towards freedom of speech. 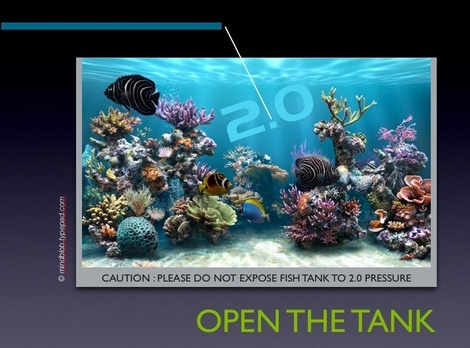 How can a fish tank pretend to communicate to the ocean if it works like a closed system? Considering David Armano's brilliant vision of "Flat world vs round world", companies should consider to change the way they work. Just like "publishing idea on social networks and see if idea takes off", they should open the tank and let the fishes free to bring new ideas in. I like this ad for Orange broadcasted in France... it is a powerful metaphor and a very nice film. Okay, this is just an image, but my question is : how could companies consider marketing 2.0 as a tool to keep in touch with consumers, and not consider 2.0 internally as well? This is probably what makes some companies move faster than others... keeping an open mind and trusting passionate members, letting them lead the company outside the boundaries of the tank. Plus it must feel good to work for such a company. I was really touched by DA's post about "Everyday impressions" at Digitas when I read it. In the near future, I'm wondering how people who are used to give opinion in the ocean will behave in the companies they work for. Will they accept "push communication" there, when they refuse it outside? Wonderful metaphor and spot-on insights. I'm finding (at least in the US) that it's getting really difficult to TALK with real people at companies whenever I -- as a $-paying customer -- need help with a product or service I'm buying or already paying for. It's quite frustrating. Perhaps this is an example of their shutting off the valve to the ocean. Why should they limit input (ideas, suggestions, complaints, praise) from their customers? Thank you for your comment. I really thought that the US had great after sales and customer service (at least compared to Europe). So, yes I agree with you on that. Limiting inputs is like limiting success. I think that companies who want to survive will have to open the tank. As I pointed out in the post, I believe it all starts from within the companies where input from members should be considered as precious by management. These inputs have indeed a strong link between the company they represent (products, culture) and the outside market. So, the ideal metaphor vision of the fish tank would be a tank where fishes from inside could build links between them and the wild ocean -Thinking about Pixar film "NEMO" here, where the fishes inside the tank are being creative to get out. This was only possible because there was a connection with the Ocean first!- Then finally, open an access from the tank... to the ocean and visa versa.